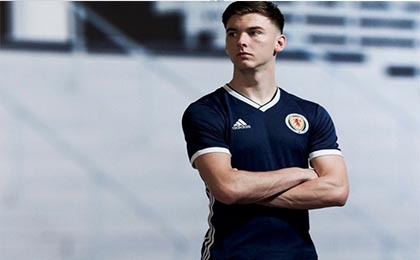 If you want to buy cheap scotland shirt for 2018-19 season, buy it here in cheap-football.com , Check our exclusive range of scotland Football Shirts / Soccer Jerseys and Kits for adults and children at amazing prices. Get the cheap scotland jersey shirts, soccer kits with wholesale price, Free Shipping Worldwide! Scotland national football team represents Scotland in international football and is controlled by the Scottish Football Association. It competes in the two major professional tournaments, the FIFA World Cup and the UEFA European Championship. Scotland, as a constituent country of the United Kingdom, is not a member of the International Olympic Committee and therefore the national team does not compete in the Olympic Games.Scotland is the joint oldest national football team in the world, alongside England, whom they played in the world's first international football match in 1872. Scotland have qualified for the FIFA World Cup on eight occasions and the UEFA European Championship twice, but have never progressed beyond the first group stage of a finals tournament. The last major tournament they qualified for was the 1998 World Cup. The team have achieved some noteworthy results.